but you still need the Karpas. At the Passover Seder we invite all who are hungry to come and eat. But, we say it in Aramaic. Maybe so that the poor shouldn't understand. Over 800,000 kids are facing a miserable Passover. Because, that's how many Israeli children live below the poverty line. Imagine how their widowed and divorced mothers feel -- unable to provide a decent Seder meal. Afikoman? Forget about it! Yet, Passover is all about kids and miracles. About how we were once slaves, but now we're free. What a cruel joke, when there's no father and no food. 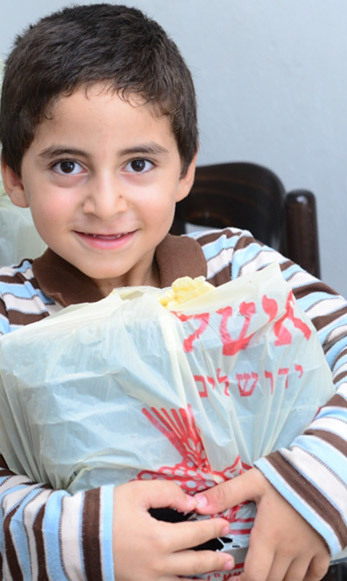 Colel Chabad has been rescuing the Seders of Israel's poorest families for over 200 years. With your help -- and only with your help -- we can do it this year too. Don't pass over this opportunity to keep your Seder promise. Give now. Give generously. Over 800,000 kids are counting on YOU!